If you are using uncompressed audio (WAV or FLAC files) I first recommend that you use a tool to compress them into Vorbis files or another format supported by FMOD. Note that although MP3s are supported (and we use them in this tutorial), FMOD does not grant you a license to use MP3s in commercial applications – this must be paid for separately. In the Solution Explorer window, click the Resource View tab, or press Ctrl+Shift+E (default keyboard shortcut for C++ setup) to display it. Right-click the project to which you wish to embed resources, and choose Add -> Resource from the menu. In the window that appears, click Import… and choose the audio file to embed. You will need to change the file filter to All Files, as only graphic formats are shown by default. You will be asked to enter a name for the resource type. Enter any short descriptive name you wish, like Audio or MP3, and re-use the same name for each subsequent import. Once you are finished you should have something like Figure 1 in Solution Explorer, with an automatically generated file called resource.h in your project. Do not edit this file, Visual Studio will handle updates automatically as you edit your resources. Note that it includes several #defines which give each of your embedded resources a unique ID. This is used in your code to locate them later. The above lines correspond to one of the resources shown in Figure 1. You will need to change these to match your own project settings. for a buffer size of 64K. You may wish to experiment with this value to get the best performance if your application suffers from stuttering or broken up audio when streaming. In Part 4 of our series on FMOD we will look at how to do a real-time frequency analysis of a playing stream, such that we can add visual effects or events to our game that trigger in time with the playing audio. Have fun! After being created in FMOD, is it necessary to keep the Lock and the handle? No, if you read the MSDN page on LockResource it is actually a misleading name, it doesn’t lock anything. FMOD_OPENMEMORY causes a resource to be copied into its own buffers so you don’t need to keep the handle either. To avoid the overhead, you can use FMOD_OPENMEMORY_POINT to use a pointer to the resource directly. Now… what should one do if their Add -> Resource option is disabled? ._. Well, it is! 😦 I am using Express 2010. Uh… would you be able to recommend any other course of action? …From what I’ve heard, creating resource files is disabled in the free versions, but they can still be imported and go from there. So then… the problem becomes finding some other third party software that can convert mp3s into resource files. I haven’t managed to find any that work. …have you? You shouldn’t need to convert them; the IDE maintains an .rc file automatically which contains the filenames and resource types of each external resource. If Express doesn’t support importing resources in the IDE, my only suggestion would be to see if you can do it on the command-line with the supplied tools. Unfortunately I’m not an expert on that. …Well, Miss Katy, I’ve had quite the adventure. After screwing around with multiple third party programs and command line tools, my resource-creating endeavors were hitting a brick wall. 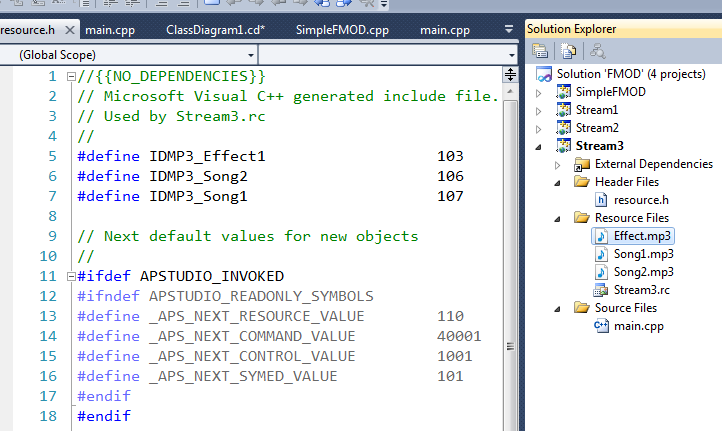 Eventually I went and found an Ultimate version of Visual Studio, which DID let me Add -> Resources! Yay! So then… I began following everything in this post, to the letter, and I kept getting different run and/or compile time errors for some reason or another. The most consistent one was FindResource returning error code 1813 (something about not being able to find the file). Desperately, I tried prepending that pound sign in front of the integer, and… miraculously… it worked. I didn’t believe it… every other example I’ve looked at used MAKEINTRESOURCE() (including yours!!). And somehow it’s worked for everyone but me. My resources.h file and my .rc file looked exactly as they were supposed to… So what the hell then! Was my FindResource function just being retarded? Converting the “INTRESOURCE” to something other than the correct value..? Whatever it is, that random octothorpe sure saved the day (and my sanity)! Instead of MAKEINTRESOURCE, I just ended up concatenating “#” with the number and passing it directly through FindResource’s second argument. I now have a superduper awesomesauce game that DOESN’T have a massive bin folder full of mp3s following it! And I have (mostly) you to thank for it. Sorry ’bout all the rambling. I just got really excited after finally solving this, so I felt like sharing my story. Thanks again, and… have fun eating those cookies!